MICHAEL VICKERS has been accepted as one of the participating artists to the Wagon Station Encampment Residency. The Wagon Station Encampment consists of 10 sleeping pods, called wagon stations, as well as a communal outdoor kitchen, open-air showers and composting toilets. 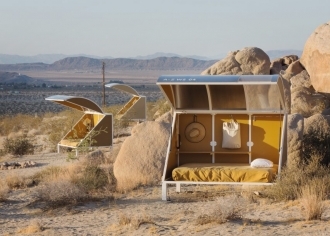 The encempment is located on a 35 acre (14 hectare) site near Joshua Tree National Park, which is dotted with unusual rock formations rising up from a vast expanse of desert. “How to live?” and “What gives life meaning?” are core issues in both Zittel’s personal life and artistic practice. Answering these questions has entailed the complex relationships between our needs for freedom, security, autonomy, authority, and control, observing how structure and limitations often have the capacity to generate feelings of freedom beyond open-ended choices. Click here, to read more about the residency. Click here, to read more about MICHAEL VICKERS.